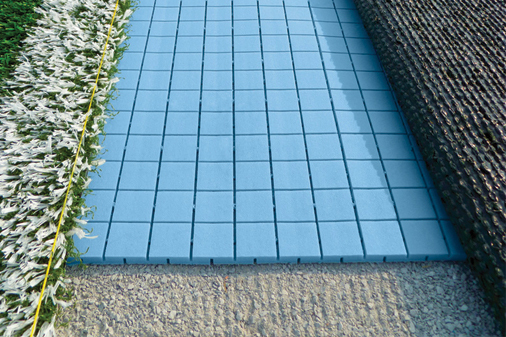 Alveosport is a cross-linked polyolefin foam product designed specifically as a shock pad in artificial turf systems. It is manufactured using only virgin base materials so that the technical properties can be precisely controlled. By using different types of resins and optimizing the thickness and density of the foam, we can fine-tune the technical layer to deliver just the right shock absorption, energy restitution, ball bounce, and resilience for any type of sports field. This high-performance technical layer is part of what makes the new generation of artificial turf systems a marked improvement over the old. Alveosport is non-biodegradable and releases no harmful substances known to pollute soil, water, or air. The polyolefin foam does not hold water or support colonization by bacteria or other microorganisms. Outstanding compressive creep characteristics additionally contribute to long-term stable performance over a wide temperature range. With a patented design for two-way expansion and contraction, the shock pad adjusts to temperature fluctuations without buckling and with no change of the overall footprint. Alveosport is perforated for drainage – water flows through holes in the sheet but does not enter the material itself. Drainage is efficient; the playing field remains usable even during moderate rains.